Iranian President Mahmoud Ahmadinejad said Wednesday the Holocaust is a "myth" in another sharp attack on Israel's right to exist that drew immediate harsh criticism from both the Jewish state and from Germany and the European Commission. Germany's foreign minister blasted the comments as "shocking and unacceptable" and warned that they will influence crucial upcoming nuclear talks between Europe and Iran. Speaking to thousands of people in the southeastern city of Zahedan, Ahmadinejad said: "Today, they have created a myth in the name of Holocaust and consider it to be above God, religion and the prophets." Ahmadinejad first provoked an international outcry in October when he called for Israel to be "wiped off the map." Previously he expressed doubt about the Nazi destruction of European Jewry during the World War II. But Wednesday was the first time when he said in public that it was a myth. Touring southeast Iran, Ahmadinejad said that if Europeans insist the Holocaust did happen, then it was they who were responsible and they should pay the price. "If you committed this big crime, then why should the oppressed Palestinian nation pay the price?" Ahmadinejad asked. "This is our proposal: if you committed the crime, then give a part of your own land in Europe, the United States, Canada or Alaska to them (Jews), so that the Jews can establish their country," he said. That comment developed further a theme he first raised in Saudi Arabia last week. In Israel, Foreign Ministry spokesman Mark Regev said: "The repeated outrageous remarks of the Iranian president show clearly the mind-set of the ruling clique in Tehran and indicate clearly the extremist policy goals of the regime. "The combination of fanatical ideology, a warped sense of reality and nuclear weapons is a combination that no one in the international community can accept," Regev added, referring to allegations that Iran is developing nuclear bombs. In Berlin, Foreign Minister Frank-Walter Steinmeier said his government had summoned the Iranian charge d'affaires to make "unmistakeably clear" its displeasure. "I cannot hide the fact that this weighs on bilateral relations and on the chances for the negotiation process, the so-called nuclear dossier," Steinmeier said, referring to European talks with Iran on its nuclear program. In Brussels, European Commission spokeswoman Emma Udwin said such "completely unacceptable" comments would do nothing to restore confidence in Iran. "We feel very strongly that Iran is damaging its own interests with these kind of remarks," she added. 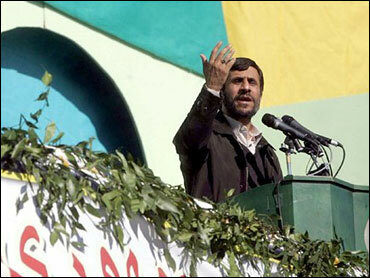 Ahmadinejad said the West had harmed Muslims, invaded their countries and plundered their wealth. "If your civilization consists of aggression, making oppressed people homeless, suffocating the voices of justice and bringing poverty to a majority of the world's people, we say loudly that we hate your hollow civilization," he said. The president's views sharply conflict with those of his predecessor Mohammad Khatami, a moderate who used to call for dialogue among civilizations and promoted a low-key understanding with the United States that stopped short of diplomatic relations. Inside Iran, Ahmadinejad's remarks have been criticized by some of his conservative allies who fear he is hurting the country's image. Moderate Iranians have called on the ruling Islamic establishment to rein in the president. But Supreme leader Ayatollah Ali Khamenei, who has the ultimate say, has backed Ahmadinejad's calls for Israel's elimination. Ahmadinejad criticized the United States for refusing to sell Iran spare parts for its civilian planes as part of its long standing embargo against the country. Iran has suffered a series of plane accidents — most recently on Dec. 6 when an aging U.S.-made military transport plane crashed into a tall building in Tehran, killing 115 people. Iranian officials have blamed Washington for the crashes, saying they are partly caused by the difficulty in obtaining spare parts. "No country is authorized to impose spare-part sanctions against another country. Nothing can justify this," Ahmadinejad said Wednesday. Ahmadinejad said the denial of spare parts was a reason why Iran would not trust Western promises to give it nuclear fuel. The country is currently at loggerheads with the West over its insistence on enriching uranium to fuel its first nuclear reactor, which is due to start generating electricity next year. The Europeans, with U.S. backing, do not trust Iran to have its own enrichment process, as highly enriched uranium can be used for nuclear warheads. Europe has offered to sell enriched uranium for the reactor, but Iran has rejected this. Ahmadinejad said that if Iran gave in on the nuclear dispute, there was no guarantee the West might not refuse to sell nuclear fuel in the future. "I assure you that we won't step back one inch from our nuclear rights," the president told the crowd, drawing chants of "Death to America!" Later this month, Iran is due to resume negotiations on the nuclear issue with envoys from Britain, France and Germany.